There have been other Indy 500s where Team Penske driver Will Power had the car to beat, the momentum, and seemingly the mojo—until he didn’t. The Australian, whose early career was marked by a vocal distaste for ovals, always seemed to find a way to lose the the Indianapolis 500 even when at his best. Pit speed violations come to mind. But not this time. After opening Indy’s two and a half week long “Month of May” with the Grand Prix pole and win in the the No. 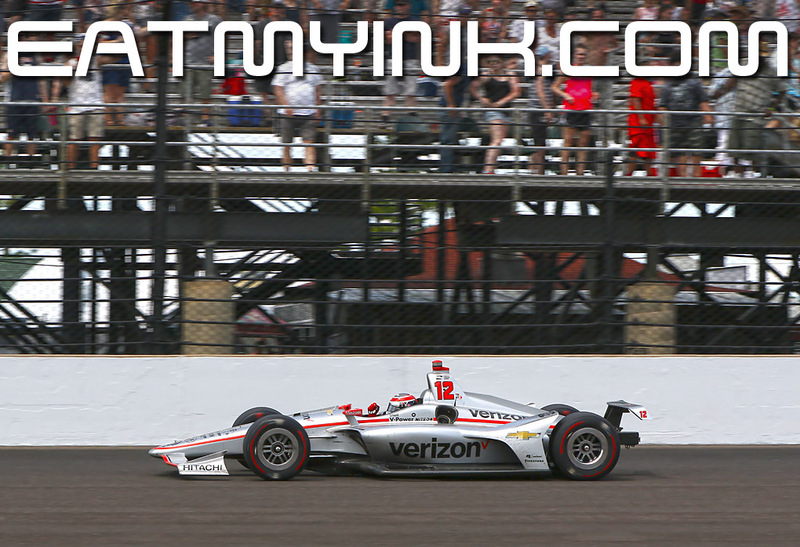 12 Verizon Team Penske Chevrolet, Power drove a flawless 500 to claim the one that’s eluded him. Power won “The Greatest Spectacle in Racing” by 3.1589 seconds to etch his name into Indianapolis 500 history. It made him the first Australian winner of the race and the first driver to sweep both Verizon IndyCar Series races at the Indianapolis Motor Speedway in the same year. Clearly ecstatic in Victory Lane, by the time Power got to the press room he sounded like a guy who’d only completed a job he was expected to do, a job he’d expected himself to do, a job that deep down he knew he should have been completing for at least the second time. Maybe it was just the heat, but Power was mostly relieved. Power led 59 of the 200 laps Sunday and outlasted a trio of competitors—Oriol Servia, Stefan Wilson and Jack Harvey—who unsuccessfully tried to stretch fuel loads to the finish. Running fourth on the final restart from a caution period with seven laps to go, Power quickly passed Servia (who like Alexander Rossi made excellent use of an invisible outside groove) and then delighted in watching as Wilson and Harvey both had to stop for splashes of ethanol with four laps remaining. Power’s first Indy 500 win was also the 34th victory of his 14-year Indy car career, tying the 37-year-old with Al Unser Jr. for eighth place on the all-time list. It also marked the 17th Indy 500 win for Team Penske and 201st Indy car triumph for the storied team—both records. Want to add fuel to the fire that Power’s stint at Penske is winding down? “Someday he might drive for me,” Ed Carpenter said in his own post-race interview. Pole sitter Carpenter led a race-high 65 laps before finishing second in the No. 20 Ed Carpenter Racing Fuzzy’s Vodka Chevrolet. It’s Carpenter’s best Indy 500 result in 15 starts. “I’ll feel pretty good about this in a couple days, I think,” said Carpenter, the only current owner/driver in the series. “It’s been a few years since I had a top 10 finish, so this feels good. The team really did a great job all month long, all day long, really. Pit stops were really good. It was almost like being out front early probably hurt us a little bit, just because guys started saving fuel a little earlier. We got behind on the fuel save. “Track position was everything we thought it was going to be coming into the day. You heard the drivers talk all week. Just couldn’t quite get it back from him. We were saving fuel through the middle part of the race when everyone was essentially trying to cut out a stop. That was a little odd. You never know how these races are going to unfold. Unlike last year, I don’t recall a Honda leading the field by virtue of outright speed, but that doesn’t mean that the brand wasn’t racy and that several were in contention at the end of a day that saw Honda’s CEO Takahiro Hachigo make a rare trip to the race. Chip Ganassi Racing’s Scott Dixon led a trio of past Indy 500 winners—and Honda drivers—who finished third through fifth, followed by Andretti Autosport teammates Alexander Rossi (fourth place) and Ryan Hunter-Reay (fifth place). The race tied the record established a year ago for most drivers to lead the event: 15. “I feel like we did what we could, and we maximized what we had,” said Rossi. Alex was clearly the day’s most aggressive driver, starting 32nd and nearly losing it to a huge wiggle in turn 2 on lap 2. That exact spot spun so many into the Fuzzy suites wall but Rossi kept it under control. Restart after restart, Rossi thread the needle between traffic and wall, making daring banzai outside passes in that otherwise invisible outer groove. “It was an emotional roller coaster today,” Wickens said after the race. “I thought we had a great car, but we just couldn’t progress. We would make some moves forward with the strategy, and then we would get a yellow that would put us at the back again. “Hats off to the Lucas Oil SPM boys – we had great pit stops all day. Finally, at the end we could let loose and pick people off, and we went from 19th to ninth in the last 10 laps. Several veterans found conditions treacherous in a race that was nearly the hottest Indy 500 on record. The official high temperature at nearby Indianapolis International Airport, 91 degrees Fahrenheit, was a single degree shy of the record set in 1937. Seven cautions slowed the pace for 41 laps, with all but the first resulted from single-car incidents. It must be said that after each incident, the Speedway staff did an excellent job of quickly cleaning up the mess and getting the race back under green. “We had anti-roll bar jam on there, so I just couldn’t change the balance,” said Davison. “I had to do the best with the adversity that I faced. If I tried any harder, I was going to swap ends, so I was getting plenty of warning signs there. If I was anywhere close to another car, I was getting huge wiggles and snap oversteer. I shot the first third of the race from an undisclosed bunker location, where I happened to be standing and chatting with Danica Patrick’s dad T.J. (right) and her attorney Jack Bjerke (left)…. Danica Patrick, in what she says will be the last race of her career, spun and crashed in the No. 13 GoDaddy Chevrolet exiting Turn 2 on Lap 68. “I’ve had a lot of good fortune here and still had some this month. It just didn’t come on race day,” said Patrick, 36. A short time later I went to Bill Simpson’s suite to say “Hi.” Someone there asked me if T.J. was upset about Danica’s crash. Danica greeting her public before the race. I hope she changes her mind about retirement. “The car was a little bit positive today and turning more than I wanted it to. I was just having to chase it a lot. Turn 2 did seem a little bit more edgy than the other corners, but I can’t say that in that point in time that I was on edge or felt like I was. It just swung around as soon as I recommitted back to the throttle again. Tony Kanaan, the 2013 Indy 500 winner, crashed in Turn 2 on Lap 189, bringing out the final caution to set up Power’s drive to victory. “Man, the Speedway, right?” said Kanaan. “We had a great day going and then we had a puncture that put us behind all day long, so I was playing catch up. It was not for lack of trying, we came back from all the way from the back of the pack to the inside of the top 10. Great restarts and…oh my God. Power earned $2,525,454 from an overall purse of $13,078,065 for his victory. Ganassi’s Mike Hull (right) and Don Prudhomme looking for all the world like brothers. Snake told me he loved racing the Baja earlier this year. REM bassist and diehard Oriol Servia fan Mike Mills. I asked him if he remembered playing an incredibly small gig with Peter Holsapple and Susie Cowsill that I was at some 26 years ago. “Yeah, at Carrolton Station,” he said without hesitation. Fred Nation and Willy Herrman flank a guy whose name I didn’t catch. I traditionally scan the crowd at the end of the race to find someone to bum a beer off of on my way back to the media center. This year my mark was these cool musicians from the Fort Wayne area.